(CHARLESTOWN, NEVIS–April 6th, 2011) Nevis Premier, the Hon. Joseph Parry will be a guest on Radio One 1000 AM in St. Thomas, USVI on Saturday, April 9th, at 10am. He said it offered another opportunity to give account to Nevisians outside of Nevis. “I believe that being a guest on Radio One 1000 AM is yet another avenue afforded to our nationals to question, to seek clarification, to get information and more importantly to express their own concerns and provide suggestions to me on the many issues and challenges facing the island of Nevis,” said Premier Parry. The Premier said that during the program he will tout several initiatives of the governing Nevis Reformation Party (NRP) Administration and keep the general public adequately informed of decisions taken by government on their behalf. The Hon. 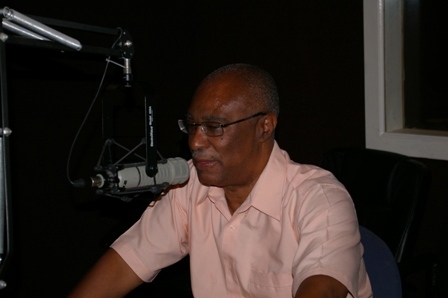 Joseph Parry has taken several initiatives to touch base with Nevisians at home and abroad including the Premiers popular radio Program In Touch With the Premier, allowing members of the public and interest groups to call in and ask questions, make suggestions or make comments. He has also included upcoming Town Hall meetings around Nevis, meetings with Sixth Form students and monthly one on one meeting’s with the general public in an office located in Charlestown. Meantime, host of the radio show Your Views and Mine, former United States Virgin Islands Senator, Mr. Roosevelt David said that he looked forward to dialoguing with Premier Parry on his hour-long program. While in the Virgin Islands, the Premier is also expected to meet with Nevisians and friends of Nevis on Sunday evening, April 10th at 7pm at Victors Hideout in St. Thomas.